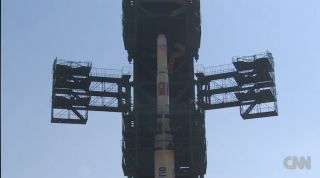 This still from a CNN broadcast shows North Korea's Unha-3 rocket, which country officials say will launch a satellite into orbit in April 2012. The rocket, called Unha-3 (Galaxy-3), could potentially launch as early as Thursday (April 12) to mark the 100th anniversary of the birth of North Korea's founder, Kim Il Sung. North Korean officials have maintained the rocket will launch a small Earth-observing satellite, but observers in the United States, South Korea, Japan and other countries see the move as a military weapons test in disguise. "Let me make absolutely clear that any launch by North Korea would be a serious, clear violation of their obligations under already-existing U.N. Security Council resolutions 1718 and 1874," U.S. Secretary of State Hilary Clinton told reporters Tuesday (April 10) after a meeting with Japanese Foreign Minister Koichiro Gemba in Washington, D.C. But the reclusive country appears to remain committed to launching the Unha-3 rocket. North Korean space officials began loading the long-range rocket with fuel today and appeared defiant in the face of unwavering foreign criticism, according to Reuters news service. North Korea's Unha-3 rocket is a three-stage booster that stands about 100 feet (30 meters) tall. In photos obtained during a rare presentation to foreign reporters, the rocket appears as a white booster with red detailing (including nose cone) with North Korea's flag and other national markings emblazoned along its exterior. The rocket will lift off from North Korea's new launch site near the village of Tongchang-ri in the country's northwest, about 35 miles (50 kilometers) from the city of Dandong on the Chinese border. The Unha-3 rocket is expected to launch on a southward trajectory, with its third stage dropping into the ocean near the Philippines, according to press reports. North Korean space officials have said the rocket will launch the Kwangmyongsong-3, which translates to Bright Shining Star-3. The satellite is reportedly an Earth-watching spacecraft designed to monitor weather conditions and provide imagery to aid disaster relief and other services. The Unha-3 rocket flight will mark the third attempted space launch by North Korea. The country claimed its most recent attempt, the 2009 test of the two-stage Unha-2 rocket, succeeded in launching a satellite, but outside observers reported no evidence that any craft reached orbit and concluded it failed. Clinton said any launch will likely be followed by a coordinated international response. "We are consulting closely in capitals and at the United Nations in New York, and we will be pursuing appropriate action," Clinton said. "But I would just underscore that if North Korea wants a peaceful, better future for their people, it should not conduct another launch that would be a direct threat to regional security."